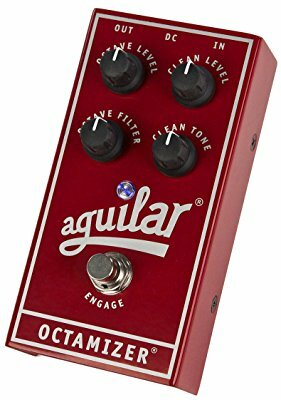 If you’re looking for an effect to give your bass some color to make it stand out in the audio mix, an octave pedal may be the best choice. These effects allow you to explore new sounds by adding some distortion and highlighting your solos, making them perfect for genres like hard rock, alternative rock, and metal. A bass octave pedal splits the signal in two octaves – one is low and distorted, while the other one is high and clean. When activated, this pedal usually produces a fuzzy, synthesizer effect, similar to that of a synth pedal. It can be especially useful if you’re playing in a cover band, since many famous bass players in recent years have used this effect – Chris Wostenholme of Muse used it for some of his most iconic bass lines. However, with so many great pedal manufacturers it can be hard to do all the research and make a decision. 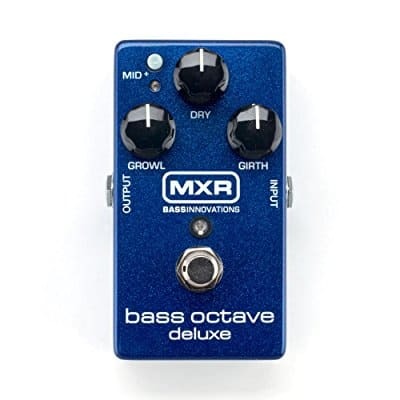 To make your choice easier, I made a list of the best bass octave pedals on the market right now. 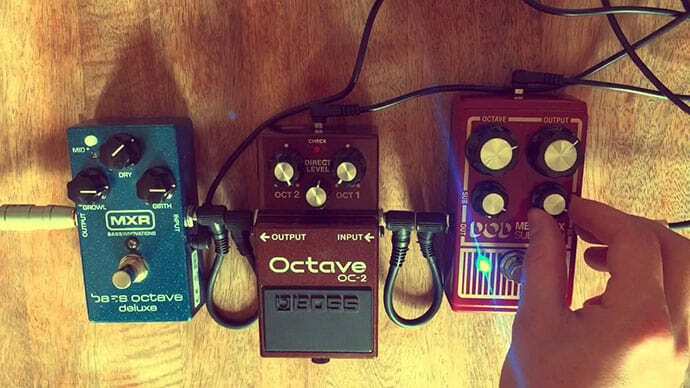 If you’d like to experiment with your sound and use bass for more than just playing along with the beat, check out these bass octave pedals that will give you the best sound for your money. At first glance, this pedal seems quite simple, as it features only three control knobs and is very easy to use. However, its simplicity doesn’t detract at all from its effectiveness. On the contrary – it’s pretty versatile and sounds good on almost any setting. Those three controls are Growl, Dry, and Girth. Dry lets you change the level of dry signal from your guitar, while Growl and Girth are used to control low and midrange frequencies. On some settings, this pedal can be really subtle and stay switched on just to give your sound some color. Like many MXR pedals, the M288 sports a hard metal casing which is very durable and looks pretty sleek. One of the most familiar names in the guitar effects industry, Electro Harmonix is known for making high-end pedals that rarely disappoint. That’s definitely the case with their iconic Micro POG, which features a smooth attack and a clean, minimalistic design. 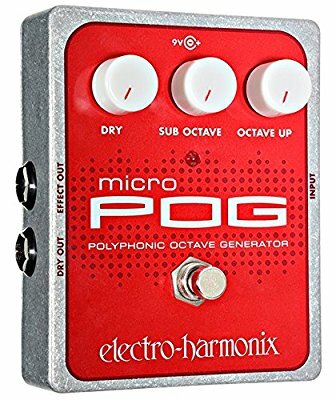 Like the MXR before it, the Micro POG has a rather simple interface with only three knobs – Dry, Sub Octave, and Octave Up. With these knobs, you control your clean guitar sound, as well as how much lower and higher frequencies will go into the mix. Its tracking is on point, although many analog pedals often struggle in this aspect. I know this is a matter of personal preference, but this pedal just looks striking. The combination of stainless steel, race-car red, and big white knobs will make this one of the most prominent pedals on your pedalboard. It’s smaller than the more advanced POG 2 but bigger than the POG Nano, so you can go even smaller if you want to save space. 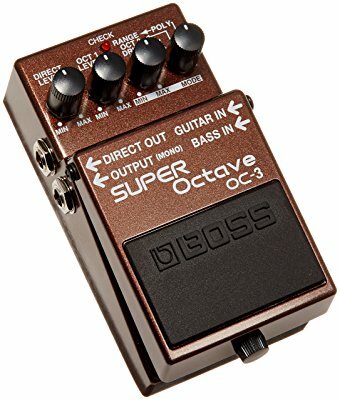 An upgrade over the Boss OC-2 (Mike Kerr of the Royal Blood loves that one), the Boss OC-3 is marketed as “the world’s first polyphonic octave pedal”. This means that, when played on guitar, this pedal produces octaves even when playing chords, not just single notes. It can go an octave up and as low as two octaves down. However, going that low on bass doesn’t make a great sound, so you will probably be using the higher octave most of the time. When you pitch it up, the sound is clean and strong and doesn’t sound too metallic or artificial. My favorite thing about this pedal is the drive mode, which adds some distortion to the octaves and gives you a lot of options to experiment and try different sounds. This is definitely one of the most versatile pedals on this list. This pedal from Mooer has a really special feature which sets it apart from all other entries on the list – 11 preset octave modes. A big white knob in the middle of the pedal switches between these modes, while three small black ones above it adjust the SUB, upper, and lower signal sections. All of these modes sound really good, as they deliver no distortion in the final output. Its design is nothing to get excited about, although it is quite small and takes up next to no space on your pedalboard. Unlike the past three entries on the list, Mooer isn’t really a high-end pedal manufacturer, which makes this pedal a very affordable choice. Out of all the entries on this list, the Aguilar Octamizer definitely produces the most natural, organic octave sound. It has four knobs that regulate octave level, clean level, and clean tone, while the filter control provides extra control, so you can shape your octave sound with complete precision. 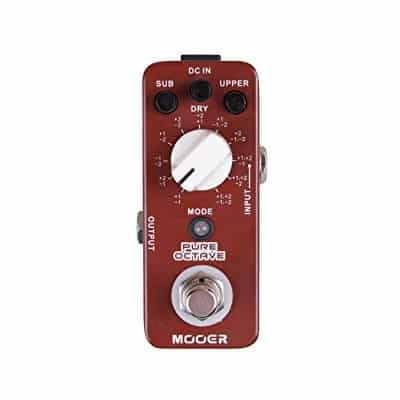 It has a solid metal casing, and like the Mooer MOC1, it’s quite pedalboard friendly. One thing that may be lacking on this pedal is some of the more advanced settings that really help you play around with the sound and add some distortion. However, if you’re looking for a subtle octave pedal with a good analog sound, this is probably your best choice. Known for its budget-friendly guitar effects, Behringer is a German company that offers some solid pedals at decent prices. Although some of their pedals are clear misses, this one definitely provides some solid sounds and a variety of interesting settings. Looking at its design, you get a feeling they drew inspiration from the Boss OC-3 pedal mentioned above. Like the Boss OC-3, it has the polyphonic mode and the drive mode which adds distortion to the octave sound. Another similarity between the two is the fact that you can use the Behringer for your electric guitar, as it too has a separate guitar input. The big difference, of course, is the sound quality – Boss OC-3 provides a more natural, analog sound. Build quality – Take a look at the pedal and make sure it looks well-built. You should always go for pedals with metal construction, as they are more durable and made to last a long time. Versatility – Try the pedal out and see how many options it has. Although you may think basic octave settings are enough, you may want to experiment with different sounds as you master the basic ones. Sound quality – You want to make sure your pedal doesn’t produce too much distortion or fuzz. Choose the ones that sound the most natural and analog, and skip the ones that sound too “robotic” or digital. All of these pedals deserve a spot on your pedalboard, but choosing the one that fits your playing style and genre is the most important. Try them out carefully and make sure that they are providing you with the sound you want. Sound quality is everything, so even if a pedal has interesting features and settings, keep in mind that it has to sound organic and natural. 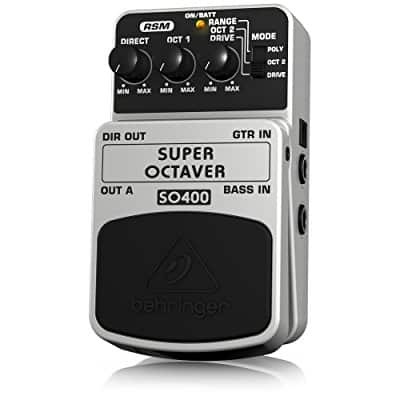 Remember, a quality bass octave pedal is a long-term investment. Take your time and find a pedal that will serve you for years to come.